Late last week, three separate announcements added to a growing belief that a renewed, positive focus on the Paris goals is emerging in Japan, among government and large corporations. The Japanese environment minister, Yoshiaki Harada, announced a “policy initiative” to oppose new or expanded coal-fired power plants, the national newspaper Asahi Shimbun reported. The environment minister does not have the final say on new power generation projects, but his opinion is considered a fundamental part of the planning process. On Friday, Japan’s largest utility, Kansai Electric Power, announced it would expand its renewable energy portfolio to 6GW by 2030, earmarking US$5bn in capital expenditure for clean power projects in the next two years. The same day Japan’s Marubeni Corporation, a significant developer of power projects in developing Asia, announced it would target a doubling of renewable energy revenues by 2023. Marubeni announced last year it was exiting coal. Its divestment decision was followed by fellow conglomerates Mitsui, Mitsubishi, Itochu and Sojitz. Three coal-fired power plant projects have already been cancelled in Japan this year. Observers in Japan remain cautious, as the country has coal-fired power projects under construction and some already approved. The prime minister, Shinzo Abe, has signalled he wants to show global leadership on climate change, ahead of the next G20 summit in June in Osaka. The speed with which Japanese government and industry have shifted focus is significant, market analysts say. It comes as global financial institutions are increasingly exiting coal. On Saturday, Australia’s largest insurer, QBE, said it would stop insuring new thermal coal projects – including mines and power generation – from July this year, and underwrite no thermal coal projects by 2030. Australian coalminers might not feel the direct impacts of these pivots for a decade or more, as most recent announcements relate to new projects, or offer staged exit commitments. The controversial Rocky Hill coalmine in the Hunter Valley will not go ahead after a landmark ruling in the land and environment court on Friday that cited the impact it would have had on climate change. Chief judge Brian Preston dismissed an appeal by Gloucester Resources, which was seeking to overturn a New South Wales government decision to reject an open-cut mine because of its impact on the town of Gloucester, north of Newcastle. The EDO joined the case last April, arguing on behalf of its client, Groundswell Gloucester, that the mine’s detrimental impact on climate change and on the social fabric of the town should be considered as part of the merit appeal. David Morris, the chief executive of EDO NSW, called the decision “momentous” and said it would be “profoundly influential” in the approval of future fossil fuel projects. In a “first of its kind” hearing, the EDO had argued that the mine should be refused in part because of its impact on Australia’s commitments to the Paris climate agreement. In his judgment, Preston noted that while there was “no proscription” on the approval of new emissions sources such as coalmines under the agreement, approval of the project “cannot assist in achieving the rapid and deep reductions in GHG emissions that are necessary” to meet the goals of the agreement. “It matters not that the aggregate of the project’s greenhouse gas emissions may represent a small fraction of the global total”, he said. He rejected GRL’s argument that the project should be allowed because emissions from the mine would be abated by other emissions reductions schemes as “speculative and hypothetical”. The judgment also rejected the mine on the grounds of its visual impact and the social impact of factors such as dust and noise on the surrounding community. Morris said the ramifications would be felt by state and federal ministers and other decision makers who assess fossil fuel projects. “This is necessarily a case-specific judgment. It relates to this coalmine proposed in the Gloucester Valley,” Morris said. “It is persuasive, influential but it is not binding on any future decision. Morris said Australia was increasingly approaching a moment when approval of a fossil fuel project could be considered “unreasonable”. “And unreasonableness is a ground of legal challenge,” he said. Climate Council chief executive Amanda McKenzie also welcomed the decision. “The NSW Land and Environment court has effectively ruled that coal – just like tobacco and asbestos – is bad for us,” McKenzie said. NSW planning minister Anthony Roberts was asked for the government’s reaction to the court’s decision. “That is the legal process and we respect the court’s decision,” he said. 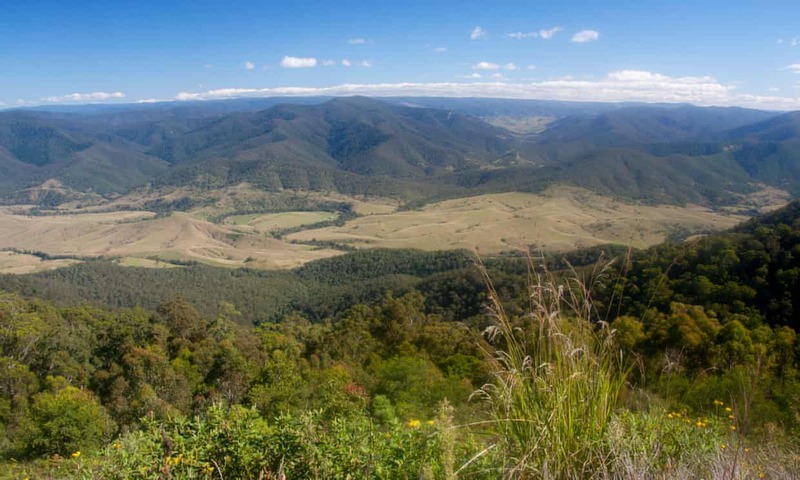 A spokesman for the NSW planning and environment department said the department was pleased the court had agreed with its recommendation on the proposed coal mine. He said the decision supported the current process of assessing developments on a case-by-case basis. In 2017, the independent planning commission rejected the mine because of its proximity to the town of Gloucester, its visual impact, and contravention of the city’s zoning plans. “The judgment confirms the Department of Planning and Environment was correct in its decision to recommend refusal of the application to the Independent Planning Commission, and the Commission was correct to refuse the application,” the spokesman said. 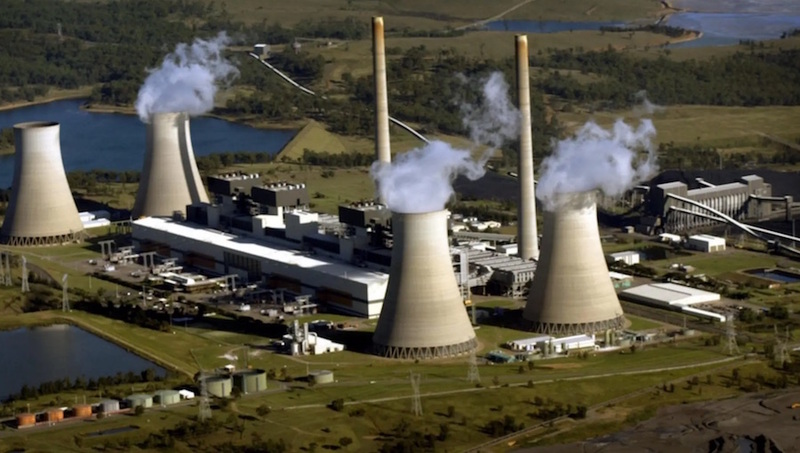 Air pollution from NSW’s five coal-fired power stations carry a “substantial health burden”, including leading to an estimated 279 deaths a year with thousands more to come before they close, a new study has found. Ben Ewald, a GP and public health lecturer at the University of Newcastle, said the impact – including 233 low-birth weight babies and 369 people developing Type 2 diabetes annually – was much worse than he expected. “Literally hundreds of people are dying preventable deaths every year because of coal-fired power,” Dr Ewald said, adding, it was “nothing short of a public health scandal” that 3429 more people will die before the plants reach scheduled closure dates. The study, commissioned by Environmental Justice Australia, examined the effects of fine particle pollution with a diameter of 2.5 microns or smaller emitted by the plants. 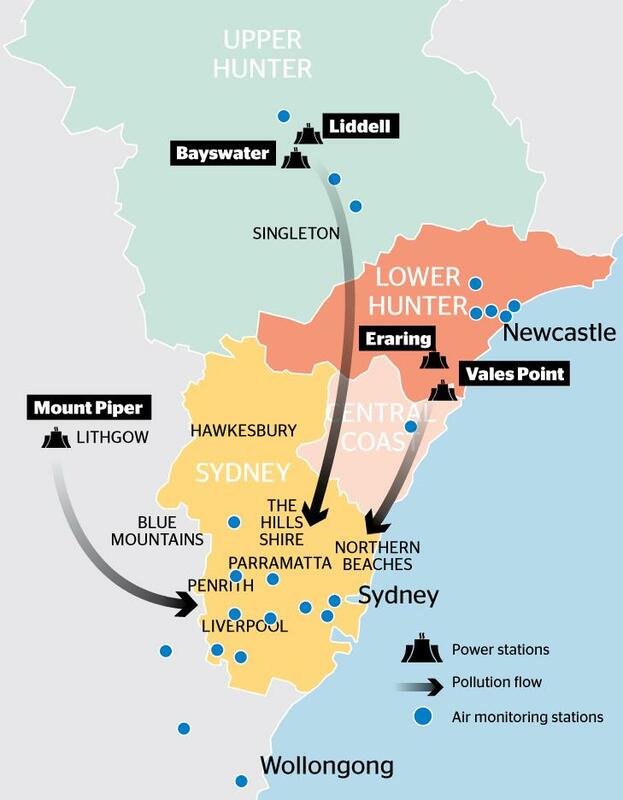 Coal combustion is one of NSW’s biggest sources of such pollution, with prevailing winds often dragging the particles – the smallest of which can enter lungs and the bloodstream – over major population centres. While filters catch most of the pollution at the plants – AGL’s Liddell and Bayswater, Delta’s Vales Point, EnergyAustralia’s Mt Piper and Origin’s Eraring – they emit secondary particles that most other nations ban. The Environment Protection Authority is now reviewing the licences of three: Vales Point, Mt Piper and Eraring. By the time the last of the five is due to shut in 2042, the number of expected low-weight births would be 3029, with new onset diabetes put at 4412, the study found. Guy Marks, principal investigator at the Centre for Air Pollution, Energy and Health Research and a professor at UNSW, said Dr Ewald’s research was “certainly at the cutting edge of this work”. The impact tally is likely to be conservative because it only focused on three health outcomes caused by long-term fine particle air pollution. It did not include health damage from short-term pollution spikes such as asthma and exacerbated lung disease, nor the effects of ozone, mercury and other toxin exposures, the report said. Dr Ewald’s approach, particularly estimates of the proportion of sulphur-dioxide and nitrous oxides in Sydney from power stations, “requires further scrutiny before firm conclusions can be drawn about its validity”, she said. Major energy firms rejected the report, with EnergyAustralia calling it “inaccurate” and yet to be formally peer-reviewed. “[W]e strongly reject the implication that our operations pose unacceptable risks to human health,” a spokesman said, adding the paper was “needlessly upsetting for the community”, a spokesman said. But community groups said tougher controls were well overdue. Sue Winn, whose family lives within a few kilometres of Vales Point and includes several asthma sufferers, said they had long had pollution “raining down” on them. “There’s got to be poor health outcomes by being exposed to this day in, day out and night in, night out,” Ms Winn, secretary of the Mannering Park Progress Association, said. Greens environment spokeswoman Cate Faehrmann has introduced a bill into the NSW parliament to limit the amount of toxic air pollution from coal-fired power stations in the state. Dr Ewald’s report “should send shockwaves through the government”, she said. Several activists involved in the protests against the International Mining And Resources Conference (IMARC) 2018 last October had their homes raided and searched by Victoria Police on Friday January 18. They were arrested, detained and interrogated and had phones, computers and other belongings seized. The Latin American Solidarity Network (LASNET), Frontline Action Against Coal Melbourne (FLAC), Melbourne Rainforest Action Group (MRAG) and other groups strongly denounce the harassment, surveillance and criminalisation of dissent and protest at the hands of Victoria Police, the Australian government and the multinational companies they serve. This is not an isolated event. These arrests are happening in the context of other social and environmental activists having been raided and harassed in recent weeks and months by Victoria Police. This is just another example in Victoria Police’s long history of human rights violations against Indigenous peoples, migrants, women, LGBT people, working people and anyone who challenges the racist, capitalist and patriarchal system that the Australian police uphold and protect. IMARC is a gathering of the global mining industry to develop and expand its operations and exploitation of people, land and water across the globe. While they talk about how to increase their projects and profits Aboriginal land is plundered and poisoned, communities are displaced from their lands without veto rights, and Indigenous and working class families are dying from respiratory diseases from mines and coal dust. When the last tonne is extracted, what will be left? 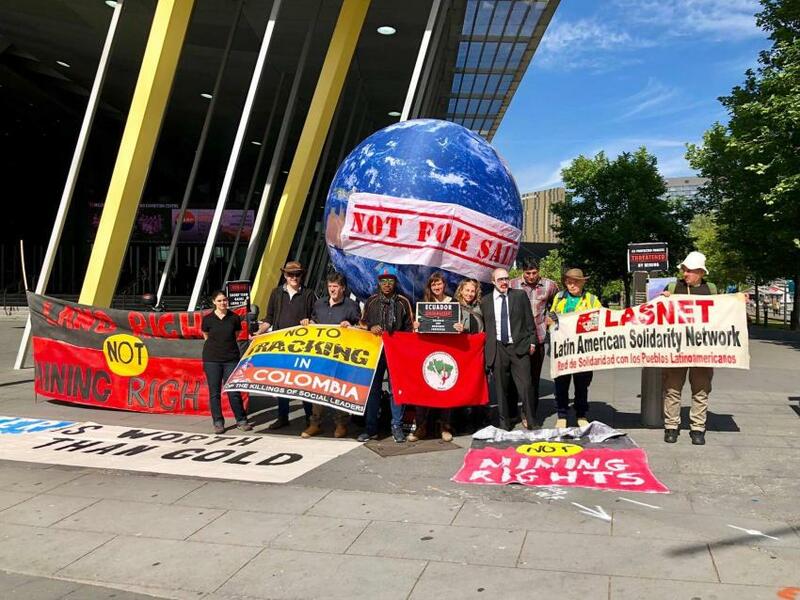 We stand in solidarity with the activists arrested and raided on Friday and in recent weeks, and with all those defending the Earth from the plunder of mining. We fight for a just and liveable future for all, from Andymathana and Gomeroi land to Ecuador, Colombia and Honduras, from Papua New Guinea to South Africa. Not to mining! Yes to life! Land rights not mining rights! 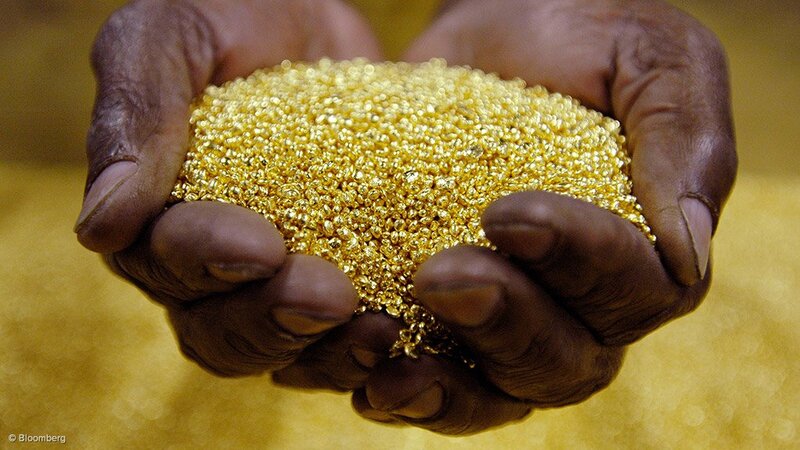 A small scale gold miner in Morobe is now worried that he might not be able to get the sum of money worth his 4.6 kilogram gold given to an Australian gold buyer in 2013. The miner (named) who is a local from Aseki in Menyamya district told Post-Courier that his gold weighing 4.6kg was given in exchange of payment and business to an international gold buyer named Chris Walker of Brisbane, Australia in 2013, but he has never received his complete payment up until today. He said it was through the arrangement of PNG National Small Scale Miners Association Incorporation vice president and general secretary Joe Bronston that linked him including 15 other gold owners from various provinces to go into business with Chris Walker. It is now after six years and he is still waiting for the complete payment of his gold. He said Mr Walker has also taken 45kg of gold from the other 15 individuals and wanted them to keep topping up the gold until 100kg then he would move his business to Port Moresby and work with them. “I was only given AUS$10, 000 (PGK 23,489.4) as a spending money according to Mr Walker and his wife Jessica Groff while 1.5kg of the total 4.6kg of gold was going to be my share in the business and rest of the payment was supposed to be given to me later,” the man said. However nothing turned out the way he expected in the agreement between Mr Walker and him. A detailed statement from Mr Bronston said he knew Chris Walker and Peter Walker for almost 20 years and have been living together as families in PNG in 1988. However, Mr Bronston when speaking to Post-Courier described Mr Walker and wife Jessica of Noosa, Queensland as perpetrators despite their close family relationship. Mr Bronston said one of the most talked about business between them was how to develop alluvial mining in PNG from which in 2010, Mr Walker came up with the plan to introduce PNG Bullion Exchange in PNG. “I informed various miners in different parts of the country and we agreed to Chris Walkers plan and the first four day meeting was held in Brisbane to achieve the plan of producing 100 kilos of gold so it would give confidence to investors to come to PNG to set up PNG Gold Exchange trade centre” said Mr Bronston. Mr Bronston said the negotiation with miners to go into business with Mr Walker was agreed by all and the trip was taken care of by Queensland customs Broker Glenys Gardener whom was contracted by Australian Coin and Bullion Exchange in Melbourne. “I did 18 trips of gold delivery under my PNG Mining Department Export Permit as Geological Sampling to Walker in Brisbane. Meanwhile the gold had a purity rate of 89percent (gold purity), Mr Bronston said. He said each time he brought the gold to Mr Walker, after confirming weight and genuineness, he then transports the precious metal to the Australian Coin & Bullion Exchange for analysis and sampling, where the gold is then refined to 99.99 gold purity. “Until 2013 the miners began following up on the establishment of Gold Exchange Trading in Port Moresby as promised. Subsequently this led to the disappearance of the Walkers. “I told them in one of the gathering of miners in Port Moresby that we must continue to produce and arrive at 100kg of pure gold then the establishment of PNG GOLD Exchange will be announced, by the time the 45kg pure gold was already in Brisbane. “However I was reported to the detectives at Boroko police station by miners repeatedly by different miners who doubted this work program (100kg gold exchange) as they felt it would drag on”, Mr Bronston said. He said some of the miners wanted money for their gold, others listened and followed what was said while a few took his families as hostage at one time. “I stopped delivering when I noticed Mr Walker and his wife Jessica stopped responding to my calls and emails during the tussle. “I even flew down twice to follow up but still no indication of their presence. They had their address changed and perhaps went into hiding,” he said. He said the matter was also reported to the Noosa Heads Police station and a complaint was also filed with Detectives Chad Kereama and Jason Brown. The investigation has since taken four years and is still pending. The proposed $22 billion project will have destructive impact on environment, including the Great Barrier Reef. With three Chinese banks announcing that they will not be financing Adani group’s controversial Carmichael mine in Queensland, Australia, the mining giant’s ambitious project – worth $21.7 billion – appears to be doomed. Earlier this year, Australian banks had backed out of financing the project. Adani Mining is facing a financial crunch as 24 banks around the world have earlier refused to finance its mining ventures in Australia. Adani’s extravagant expansion into Australian mining seems to be dogged by accusations of crony capitalism and destruction of environment, very similar to the ones in India for his Mundra SEZ project and mining activities. The opposition in Australia however has taken on a much more widespread scale. Recently, Australian journalists who visited Mundra in Gujarat to study Adani Group’s activities were harassed by local police, presumably at the behest of powers that be. The Carmichael mine has drawn the ire of Australians ever since Adani bought it in 2010. A recent survey showed that 62% people in Queensland opposed the Adani mine. 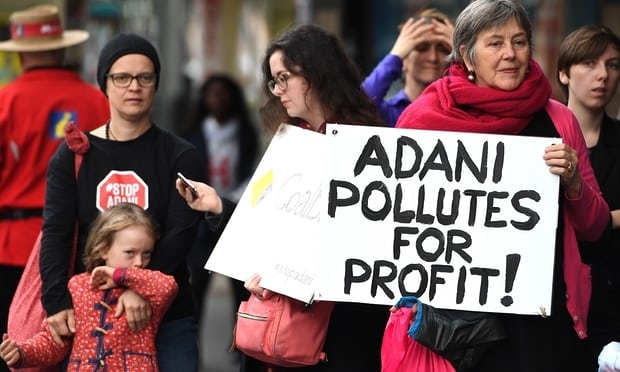 There have been a series of protests in Brisbane, Sydney, Melbourne, Townsville, Cairns, Mackay and at Adani’s work sites near Belyando in Central Queensland. Such was the pressure built by public opinion that Queensland premier Annastacia Palaszczuk reversed the government’s previous position and pledged to veto a loan to Adani if re-elected. In March this year, 13 NGOs came together to form the Stop Adani Alliance which organized a National Day of Action on October 7. During November 20 and 24, a Stop Adani Shakeup week was observed to pressurize federal MPs into opposing the mine. All over Queensland, and even elsewhere, anti-Adani T-shirts, badges, caps and other protest markers can be seen on people. Adani group has reportedly faced a series of regulatory actions in India for its riding roughshod over environmental and other laws. It has also been alleged that its explosive growth is largely due to Gautam Adani’s closeness to Prime Minister Modi since the latter’s stint as Gujarat Chief Minister. Recently, Australian Broadcasting Corporation’s investigation on its well known Four Corners programme, unearthed various dealings of Adani Mining through secret tax haven accounts in Cayman Islands and the British Virgin Islands. The Galilee basin, where the giant mine, projected to be one of the world’s largest, is located contains an estimated 7.8 billion tonnes of coal. Adani group has claimed that the mine will have peak production of 60 million tonnes of coal per year by 2022. 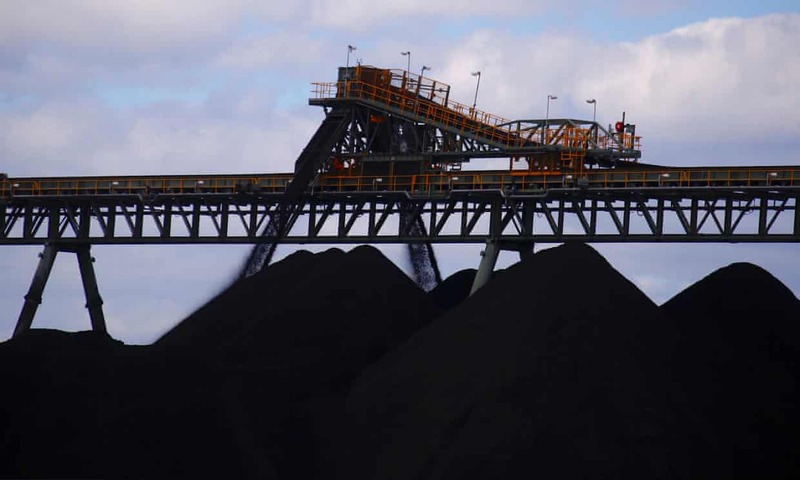 The company has acquired Abbot Point coal terminal near Mackay for $1.98 billion from the Queensland government and plans to build a 388 kilometer rail link from the mine to the port. The company is awaiting a concessional A$900 million loan from the government’s Northern Australia Infrastructure Facility (NAIF) for the rail link. The most significant reason why most Australians are opposed to the mine is its environmental impact. The mine is estimated to generate 4.7 billion tonnes of greenhouse gases. It will also use 26 million litres of water every day severely depleting the groundwater in this drought prone region. The Great Barrier Reef, already under threat from warming of the oceans and their acidification, will also be affected by the mining activity. The project involves dredging of 1.1 million cubic meters of seabed from near the Reef.Experts have vigorously argued that this will have an adverse impact on the delicate ecosystem that sustains the Reef. Adani Australia have argued that an estimated 10,000 jobs will be created in Queensland, which is currently suffering from severe unemployment. This claim has been supported even by Australian Prime Minister Malcolm Turnbull. However, Jerome Fahrer, an economist who appeared on behalf of Adani Mining before the Queensland land court, testified in 2015 that the project would create precisely 1,464 jobs. The land where the mine is planned to be built belongs to the Wangan and Jagalingou traditional or indigenous people, and is part of 30,000 sq.kms land area for which they have filed a ‘native title claim’ in 2004. The W&J peoples have launched a long and complicated legal battle to oppose the Carmichael mine, and hearing is scheduled for March 2018. Approval processes for any Frieda river mine have not yet been completed – but the Australian government is already spending ‘aid’ money to help ensure the mine does go ahead. PANAUST and the Australian government are working together to empower women through the Frieda River copper-gold project under a new initiative called the Papua New Guinean Women in Mining Project. In terms of an agreement signed at Frieda River last week, the partners say a three-year work program will strengthen the participation of women in the development forum process and ensure women receive lasting benefits over the life of the mine and beyond. “The project will provide a mentor to work with women from the Frieda River area to prepare them for participation in the development forum and help organise their governance and representative structures. Selected Frieda River employees will become women’s empowerment and safety champions,” PanAust said. The partners will also work to build literacy skills, and promote cooperative approaches to decision-making, workloads and budgeting, leadership and coalition building. At the signing PanAust managing director Fred Hess emphasised the role mining could play in supporting women. “Mining, perhaps more than any other industry, has the ability to empower women in remote communities. At PanAust, we consider it our responsibility to encourage that development. At our operations in Laos, we have provided pathways for women to acquire trades, become leaders in the company and start small businesses. 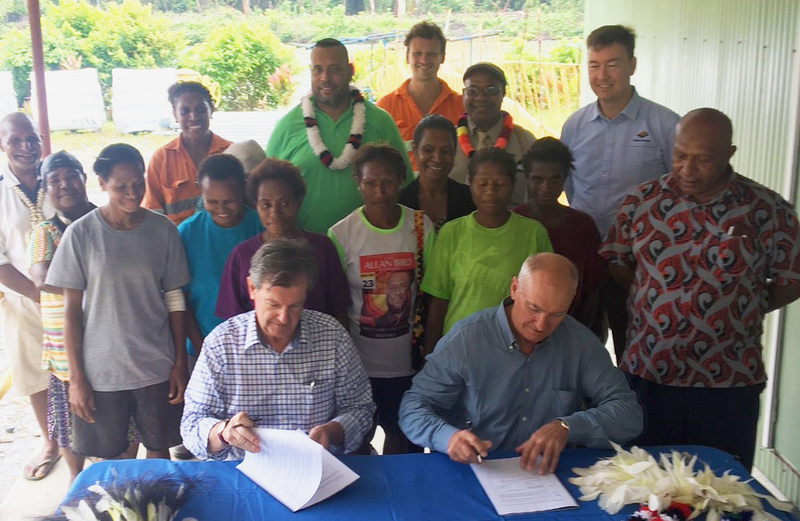 Our partnership with the Australian government will help us emulate this success in Papua New Guinea,” Hess said. Australian high commissioner Bruce Davis said Australia was taking part to strengthen women’s participation in resource development negotiations. “We will help build literacy and financial skills, as well as support women to take on leadership and decision-making roles in the development negotiations, to ensure they directly benefit from mining activities in the region,” Davis said.